The documentary hit of Sundance 2008, American Teen offers up irresistible archetypes of everybody's high school years: the jock, the nerd, the prom queen. You can't blame filmmaker Nanette Burstein (The Kid Stays in the Picture) for focusing on these easily-relatable figures - they pop off the screen. She spent the school year with the senior class at Warsaw High in Warsaw, Indiana, a close-quarters town where, it seems, the lives of the adults are not so different from the lives of the teens. You'll hiss pampered princess Megan, whose behavior verges on the sadistic; you'll roll your eyes at geeky Jake, whose way with the girls does not measure up to his fantasy world of knights and fair ladies; you'll feel for Colin, whose shot at going to college is quite literally his jump shot. Most of all you'll be drawn in by Hannah, the typical creative-misfit type, whose gamine charm is subject to alarming depressions. $45.589 thousand on 5 screens. Virtually every adult went through high school – and virtually every adult bears strong emotions about that experience. 2008’s American Teen reminds us of those days and how much about the high school experience remains the same from generation to generation. The documentary takes us to Indiana’s Warsaw High and introduces us to a mix of students. We meet teen queen Megan Krizmanich, basketball star Colin Clemens, band nerd Jake Tusing, and artsy rebel Hannah Bailey. Each one suffers from various pressures. Megan feels like she’ll let down her family if she doesn’t get into Notre Dame, while Colin needs to perform on the court to make the community happy and also to land a college scholarship. When you watch a program like this, I suppose it’s natural to figure out which character with whom you most identify. I’d have to say Jake due to his lack of success with the ladies, though he actually seems to do pretty well given his incredible level of social ineptitude. The film paints him as such a dweeb that it’s amazing to see him get any dates. Which leads me to my primary concern about Teen: it’s unclear how much of it’s real and how much is staged. Perhaps everything depicted in the film really did happen, but the movie gives off a somewhat artificial smell. At the very least it seems clear that the filmmakers had to recreate many of the events, as there’s no way they could’ve been present for all the drama that occurs. And that’s probably inevitable for most documentaries of this sort. Unfortunately, it feels like more of an issue than usual in Teen, perhaps due to some of the dramatic licenses the filmmakers take. For instance, they like to use little animated vignettes to illustrate the characters’ states of mind. This doesn’t work. It seems too “film school clever-clever” to me, and it takes us out of the movie’s reality. How can we fully accept the characters and situations as real when we’re sent into fantasy scenes so often? We can’t, and other liberties violate the sense of reality for the sake of storytelling convenience. For example, when we see a character play Solitaire on his computer as he discusses the negative aspects of his life, the game ends with text that reads “Sorry – You Lose”. This isn’t part of the Windows Solitaire game; the filmmakers added it for dramatic punch. As with the fantasy animation, it doesn’t work because it distracts us from the basic facts. It comes across like an attempt to telegraph emotions that we don’t need; we can understand various feelings without such obvious techniques. As I alluded, every documentary offers a filtered, editorialized depiction of its subjects; it’s simply impossible for them to give us a truly objective viewpoint. I can accept that, but in Teen, the interpretation of life just seems to shift too much toward what the filmmakers want it to be rather than what it was. Frankly, it often feels like they came up with the story and used the footage to fit their desires, which I don’t like. The characters and tales should evolve naturally; I just don’t get that feeling here. Perhaps the stereotypical nature of the subjects adds to the impression of unreality. Megan doesn’t exactly challenges the stereotype of the bitchy princess. Midway through the flick, we do learn some info that briefly makes her a bit more sympathetic, but her actions quickly restore our animosity toward her. Is Megan really as horrible as she seems? Probably not – I’d guess the filmmakers tilted her tale in that direction. And I also suspect the others don’t fit as neatly into their tales as we’re led to believe. Granted, I understand that the filmmakers have a limited amount of space into which to pack these stories, so they can’t all be wholly three-dimensional. I’m just disappointed that the characters so rarely challenge our assumptions. 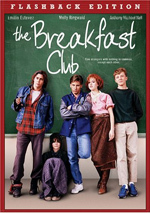 The kids in The Breakfast Club often come across as more real than these teens. I don’t want to sound too down on Teen, as it does provide an enjoyable 101 minutes. Although much of high school life remains the same as it was when I attended in the 1980s, it’s interested to see the changes. The primary example of this occurs when a girl flashes a digital camera for her boyfriend; she sends him the pic and it soon winds its way around the computers and cell phones of virtually everyone in school. Even if my female classmates shot nudie pictures of themselves - which I kinda doubt – the technology didn’t exist for the rest of us to have copies within minutes. We also see breakups via text and other digital differences. Pushy parents remain the same. Actually, I think the adults get the shaft here, mostly because Teen treats them in such a one-dimensional way. Within the film’s story, they exist to pressure the kids. Colin’s dad is a bit of a freak; he performs as an Elvis impersonator and he pushed his son to be a hoops star literally from the cradle. When it looks like Colin won’t get a college scholarship, his dad relentlessly hounds him to join the military. Megan’s father indoctrinated her with the wonders of Notre Dame from an early age and leaves her with the feeling that the world will end if she doesn’t get accepted. Other adults seem a bit more reasonable, but we don’t see as much of them, so we’re left with the impression of parents as pushy. I don’t think that’s fair, as I doubt these folks were really so demanding. But it makes for more dramatic cinema, so there you go. Although I always like to hear DVD audio commentaries, some times I miss them more than others. This is one of those instances, as commentaries from the director and from the subjects would’ve been absolutely invaluable. I’d love to get more perspective on the project, and perhaps that information would cause me to reassess it. As it stands, American Teen entertains but leaves a bit of a bad taste in my mouth; it just feels artificial, and that’s not a good thing to find in a documentary. 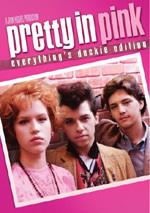 American Teen appears in an aspect ratio of approximately 1.78:1 on this single-sided, double-layered DVD; the image has been enhanced for 16X9 televisions. Shot on the fly with digital video cameras, the product showed its roots but still managed to look decent. Sharpness was one element that suffered from the restrictions of the source. Close-ups and fairly tight shots demonstrated good definition, but wider elements came across as tentative. Some prominent edge haloes didn’t help, as they added to the sense of softness. Still, this factor wasn’t a major distraction. No issues with jagged edges or shimmering materialized, and I noticed no print defects. Given the project’s scope, it went with natural colors, and these looked fine. The hues never displayed great vivacity, but they seemed adequate and actually were pretty good for a project like this; digital video documentaries usually offer flat, bland hues, so these came across reasonably well. Blacks were acceptably dark, though they could be a bit inky. Shadows were passable but did suffer from some rather opaque shots. That became inevitable given the shooting conditions, though. Overall, the image was too ordinary for a grade above a “C+”, but I still thought it was fine given its origins. Similar thoughts greeted the perfectly acceptable Dolby Digital 5.1 soundtrack of American Teen. Speech was the main factor, though the program used a lot of music and even a moderate amount of effects as well. The score and songs demonstrated nice stereo delineation, and effects gave us a good sense of place. The surrounds bolstered both in a minor way. For instance, thunder would rumble from the back speakers as well as from the front side channels. Nothing here dazzled in terms of the soundscape, but it was broader than expected. Audio quality was fine. Despite some dodgy filming situations, speech seemed reasonably natural and clear; I had to turn on the subtitles to hear a few lines, but not too many became undecipherable. Music showed nice range and definition, while effects were clean and concise. Clearly many of those elements were added in post-production, but they managed to blend well with the source material. This was a satisfying track. A few minor supplements flesh out the set. Pop Quiz: Cast Interviews go for four minutes, 12 seconds and feature remarks from Mitch Reinholt, Colin Clemens, Jake Kusing, Hannah Bailey and Megan Krizmanich. They tell us about their experiences during the film’s creation and what’s happened with them since their senior year of school. They provide some nice updates, though I’d have liked more info about what it was like to go through school with the cameras in tow. Six Deleted Scenes run a total of 17 minutes, six seconds. These include “The Long Kiss Goodnight” (6:36), “Jake on Date Ending in the Long Kiss Goodnight” (2:22), “Megan/Geoff Prom Dilemma” (3:32), “Hannah and Clarke Prom Fiasco” (1:59), “Hannah Gets Suspended from School” (1:29), and “Mitch Gets a Face Mask” (1:07). “Kiss” may be the most painful “romantic” scene I’ve ever endured; how Jake ever got a girl to even remotely tolerate him astounds me when we see him in “action”. “Date” offers an abbreviated version of “Kiss” that doesn’t show the awkward build-up to the kiss. “Dilemma” depicts Megan’s teasing behavior, and “Fiasco” offers Hannah’s reaction when another girl asks Clarke to go with her. “Suspended” follows all of Hannah’s days away from school, while “Mask” is a short comedic beat. Most of these are pretty interesting, though they continue to suffer from the appearance that they’ve been staged to some degree. Under Hannah Blogs, we get 10 segments that last a total of 18 minutes, 49 seconds. These are actually just outtakes of shots filmed for Teen; I guess they’re called “blogs” because they ran on the Internet. Anyway, they just offer Hannah’s thoughts on subjects such as her dog and the alleged beauty of Rupert Grint. They remain reasonably entertaining. Five Character Trailers appear. Each one focuses on a different film participant; we find promos for Hannah, Mitch, Jake, Megan and Colin. They use footage from the released flick, so don’t expect anything new. Still, they promote the movie pretty well. The DVD opens with a few ads. We get promos for Defiance, The Duchess and Ghost Town. These also appear in the Previews area along with clips for Iron Man, How She Move and Son of Rambow. While consistently watchable, American Teen suffers from a few elements that distract from its sense of reality. I can’t say how much of it represents real life and how much fudges things, but the film leaves us with an impression of unreality, and that’s not good. The DVD provides perfectly acceptable picture and audio as well as a few decent extras. Teen is an entertaining disappointment, but it remains a disappointment nonetheless.